Jim Reveley has offered to cook for us again! Ride in on Saturday and camp for one or two nights. He will serve Saturday dinner & Sunday breakfast down at the ranch house. We will have the mesa & lodge as usual. Many great So-Cal. riding options are available on Sunday for those stay for a 2nd night. Hwy-33 south to Ojai is a sweet piece of heaven. You can ride the canyon roads above Malibu and have lunch at the Rock Store on Mulholland Drive. This year I'm planning to lead a Sunday ride to the Solvang Vintage Motorcycle Museum. Dinner Sunday night will be at "The Place" in Ventucopa. Tina's Diner in Maricopa is the best place for breakfast on your way home. As with our private Songdog events in the past, we will define a shooting area behind the lodge. Bring your guns and ear plugs for a little target practice before dinner each evening. Our 2010 Songdog Ride report! The rustic lodge will be available for those who wish to be indoors. 4"-thick sleeping pads (included w reg. fee, while supplies last!) will be available on a first registered, first served basis. Bring your own sleeping bags and tents if needed. Running cold water in the kitchen. An 1-seat outhouse with a great view. Advanced registration & payment are required. 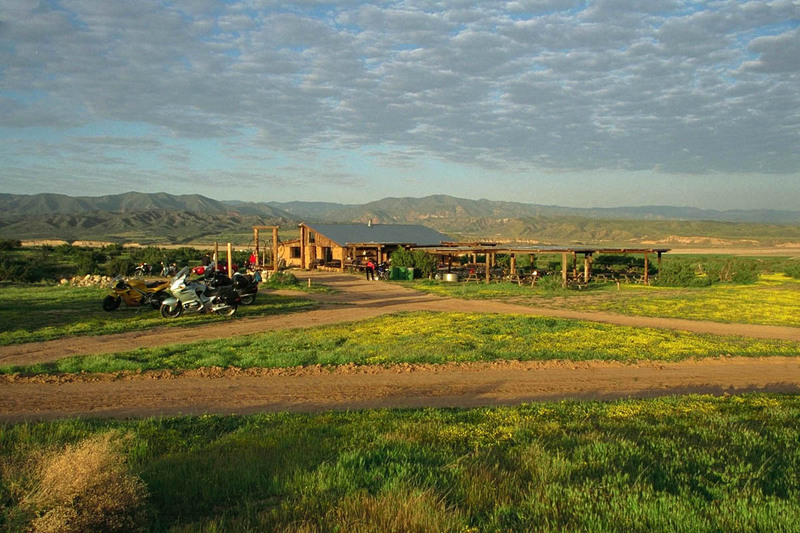 The fee includes Saturday dinner, Sunday breakfast, sleeping pads, and camping on the mesa for 1 or 2 nights. Advanced Registration CLOSES at 6:00PM - Monday, May 13th, to get an accurate head count to Jim to buy food & supplies. LATE Registration will only be accepted with much groveling and an additional "crisp" 20-dollar bill. NOTE - This is a rain, shine, or whatever event. You can cancel before the advanced registration closes, but afterwards refunds can only be offered if you are replaced by a late entry. Folks are welcome to get to Songdog by any means or route you wish. Arrive about 5:00-6:00PM to setup camp before the evening festivities get the better of you! The entrance to the Songdog Campground is on Ballinger Canyon Road, off Hwy-33, south of New Cuyama, California. The S.F. Northstars Songdog Ride! Ride route information will be available later. YEEHAAA - We're going back to the DOG!! !